Males are larger than females when mature and have a more "bristled" appearance. Prefers pea gravel or large rounded stones with hiding places. 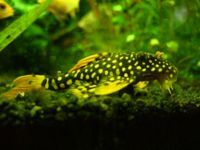 Will uproot plants so this fish is not planted tank compatible.